Transferring or managing files by connecting your Android devices to computer can be hectic process. As every time when you want to transfer anything to your device you will have to plug in the USB Data Cable to your computer or PC. But what if you can transfer files from PC to Android Wirelessly, your half of the time in searching and plugging in the USB Data Cable will be saved also you will also able to access or manage your android device wirelessly on any computer without connecting any USB Data Cable or any software on your computer. Where ever you go on any computer you will be able to transfer files to your Android Device wirelessly without carrying a USB Data Cable with you. Transferring Files from PC to Android using WiFi will give you the freedom to manage and access your data on Android without connecting any USB Data Cable. So let’s find out How to Transfer Files from PC to Android using WiFi. 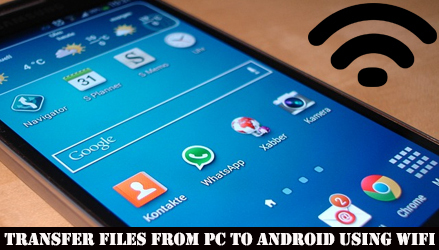 This Method to Transfer Files from PC to Android using WiFi will work on all Android OS devices like Smartphones, Tablets etc. The Connected WiFi Connection should be same on both Computer and Android Device. You will be able to transfer files from Computer to Android as well as transfer files from Android to Computer. 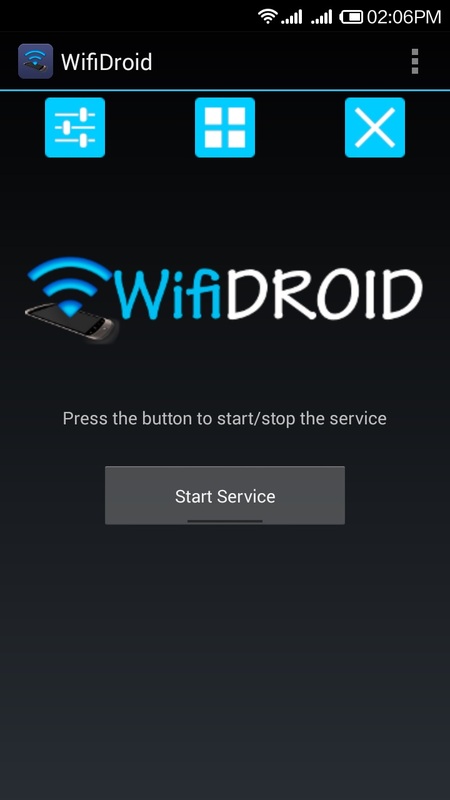 Go to PlayStore from your Android Device and search for “WifiDroid” App and Install It. After the App “WifiDroid” gets installed launch the app. 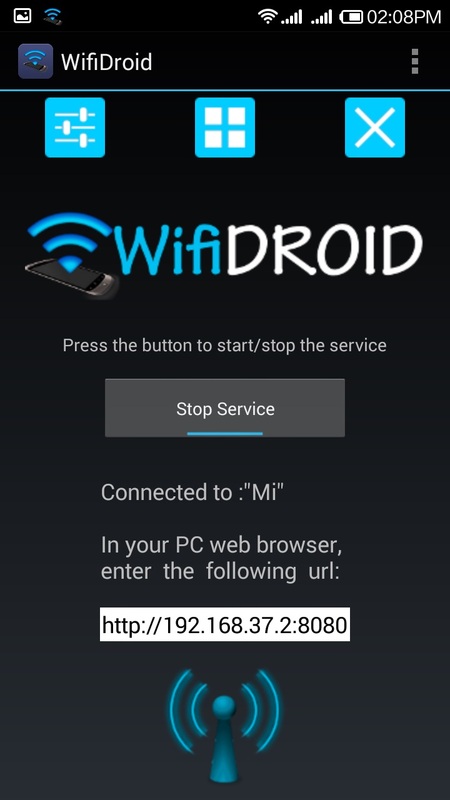 In WiFi Droid click on Start Service, when the service starts it will give you the address to access your Android Device Files. Open Web browser on your computer and type the URL as its showing in the WiFiDroid in my case the URL is “//192.168.37.2:8080“. So in your web browser after visiting the URL you will be able to see all files and folders in your Android Device, so now you can manage your Files from your Computer. If you want to access your SD Card you can also do it by clicking on Storage and then open the SD Card and explore the contents of it. 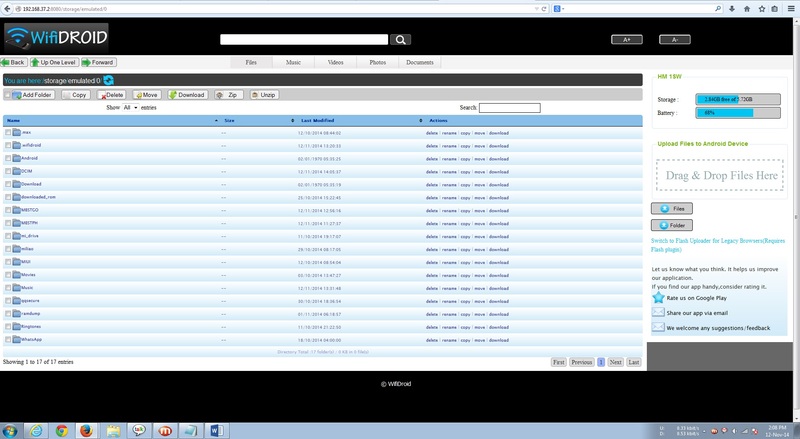 And when you have done managing the files to stop you will have to click on Stop Service in WiFiDroid App. It’s that simple to transfer data through WiFi from Android to PC or PC to Android, so we hope that next time onwards when you want to access anything from your Android to Computer you will use this method to connect your device wirelessly to PC.